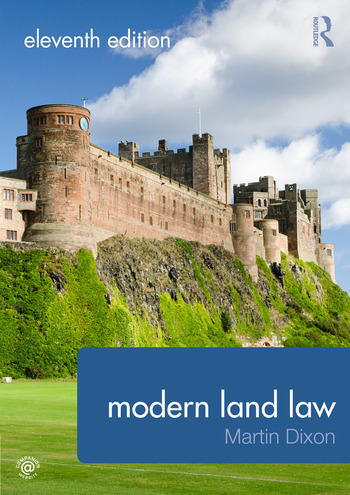 Modern Land Law is one of the most current and reliable textbooks available on land law today, offering a lively and thought-provoking account of a subject that remains at the heart of our legal system. Dispelling any apprehension about the subject’s formidability from the outset, this compact textbook provides an absorbing and exact analysis of all the key legal principles relating to land. Written with students firmly in mind, a clear introduction to every chapter frames each topic in its wider context and corresponding chapter summaries help to consolidate learning and encourage reflection. The 11th edition has been thoroughly revised and updated to address key developments in the law including quasi-easements, recent developments around the interplay of criminal law and land law in adverse possession, and the difficulties and uncertainties inherent in determining remedy in cases of proprietary estoppel. Professor Martin Dixon is a Professor in the Law of Real Property, University of Cambridge, Honorary Bencher of Lincoln's Inn and a Fellow of Queens' College, Cambridge. He is visiting Professor of Law at City University, London. He examines and writes extensively on property law and is the Editor of The Conveyancer and Property Lawyer, the leading property law journal.